In the previous articles we discussed what scales and major and minor modes are, as well as how a scale can be harmonized according to its different modes, thanks to chords. We also started exploring the harmonic movements of music due to cadence, which is based on the functions of the different scale degrees within the song. "Okay, that's the theory, thank you very much, but when are we going to actually start harmonizing?," you ask. Hold your horses! We'll get there! Would you be able to tell which notes of a bar ought to be harmonized and when? Eh? I didn't think so, either. Well, that's what we are going to tackle in the next articles, looking into chord tones, non-chord tones and harmonic rhythm. First of all, it's important to know that some notes are great at bluffing, in other words, they don't really have the function they seem to have at first glance. In order to assign them their correct function, it's critical to remember to which chords they belong, and to be able to tell which notes belong to a given chord and which ones don't. Enter chord tones and non-chord tones. Chord tones are those that belong to a given key or...chord. For example: G is a chord tone, among others, of the C major chord and the scale of the same name. The fact that a note of a melody isn't fulfilling a given function doesn't mean that it cannot be part of a chord that is performing that same function. So, in the following example, the D melody note isn't the dominant of C. However, you could harmonize it with the G major dominant chord, because D is indeed a tone of that chord. This results in the D-C chord change at the end of the song transforming into a V-I harmonic progression ─ a perfect cadence ─ which could eventually be used to bring the song to an end. 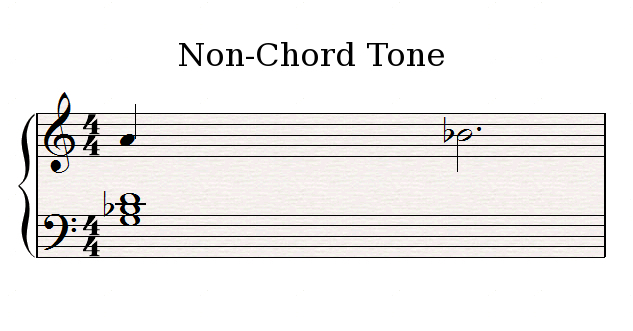 For their part, non-chord tones are those that don't belong to a given chord or key. In the following example, A is a non-chord tone of the G minor chord that accompanies the melodic line. Also note that its presence is very brief, since it urgently calls to be resolved to Bb which is a tone chord of the G minor chord. As I mentioned in the previous installment, there's no need to harmonize every single note of a melody. Suffice to say, when you harmonize a note of a bar with a chord, you will often end up with non-chord tones in the same bar. In many cases, these notes do not need to be harmonized themselves and, as such, they are called "passing" tones.. You can recognize them in the following way: They are placed between two notes, separated by an interval of a major or minor second, and continue their movement in the same direction, be it upwards or downwards. Thus, in the following example, A is a non-chord tone of G minor and a passing tone between G and Bb, which are tone chords (and root notes) of G minor (first bar) and Bb major (second bar). 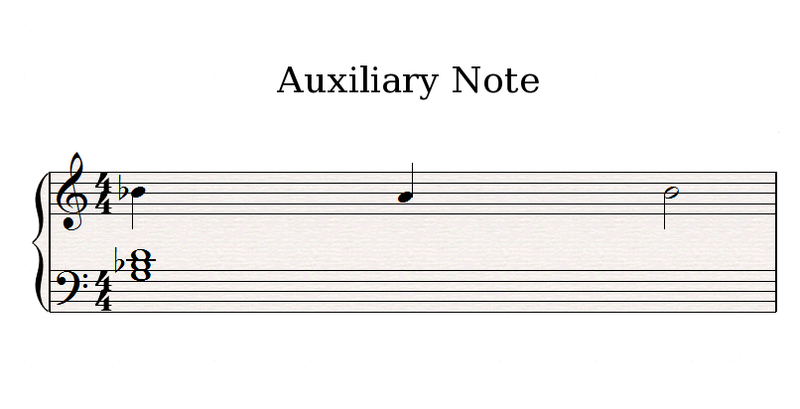 When the movement is not uniform, when it moves up and down or vice versa, the middle note is called an "auxiliary" note. Finally, another type of note that doesn't require any specific harmonization is the so-called "anacrusis." Behind this admittedly uncanny name lies what is commonly referred to as a "pickup note," in other words, a note or group of notes that serve as an introduction to a musical phrase. In the following example, I should point out that the anacrusis is not made up of chord tones of the subsequent C minor chord and that, given the small intervals that separate them, they would be difficult to harmonize with one single chord. In other scenarios, an anacrusis could be easily harmonized but it's often desired to preserve the lightness of the note on its own to avoid making the harmony too dense. In the end, though, it's your call and if you want to harmonize it, you are more than free to do so! In the upcoming articles we'll discuss the stability of chords.